This name “Encierrillo” is used to describe the removal of the bulls from their pens in the Rochapea the night before the running of the bulls. The six bulls are brought up on foot to the pen in Santo Domingo in readiness for the following morning’s running of the bulls. There are no runners used on this stretch between the Rochapea and Santo Domingo. The event takes place at about 11.00 at night. It is necessary to get a pass to watch the event. You can get it at the Cultural City Office at Descalzos street a few days before the fiesta, but it’s not easy to get it because is not available on Internet. The stretch is about 440 meters long. 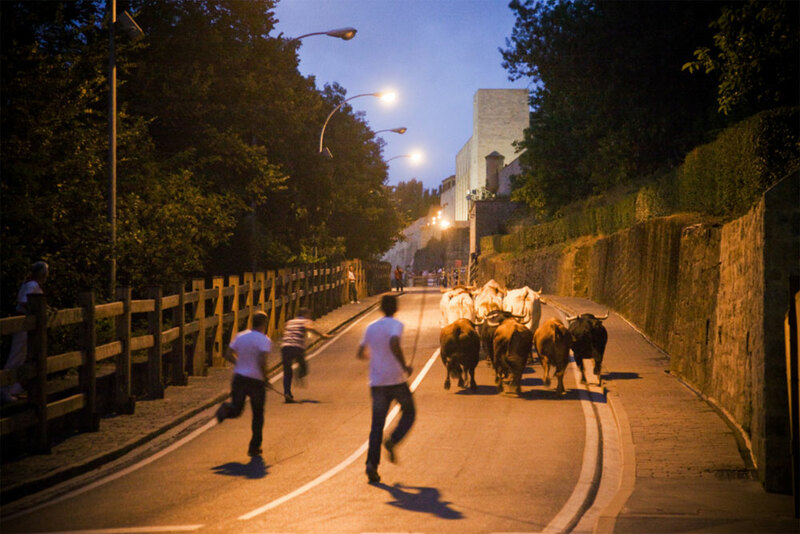 A few minutes before the bulls are let loose, a group of municipal police clear the stretch and the bull-minders take up their positions along the route. A cornet is sounded to announce that the pen in Santo Domingo is opened and in readiness. A guard on the bridge of the Rochapea, on hearing this, blows a second cornet to announce that the route is all clear and then the pens are opened and the six bulls and bell-oxen are let out with the bull-minders in close attendance behind them. The spectacle is watched in silence in total contrast to the noisy reception the bulls will experience the following morning when they make their run from the Santo Domingo pen up to the Bullring. This event takes place late at night when it is already dark and for some people it has a certain mystìc – the majestic bulls cantering silently along under the still light of the shining moon. If you are not a real fan of the bulls the whole thing might seem a bit of a damper but for some people it has its emotion.